Well hello, that was a bit of an unexpected blogging break! November really did a number on me it seems. I managed to half write two blog posts and then not finish them or publish them. We did still manage to get plenty of undocumented larking around done, but nothin' in bloggitty blogland. Sorry about that. December has been just as sparse on the blogging front around here too, because we flew off to Blighty a couple of weeks ago, to see the fam. We'll be back in the US again in the new year, if Heathrow can pull itself together amidst all the snow, and likely things will calm down a bit for more regular happenings on Filth Wizardry :) Hope you all haven't given up and unsubscribed by then! 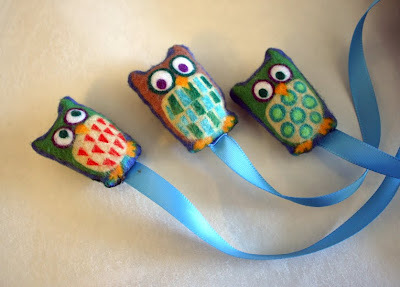 In the mean time, I wanted to post a few ideas of things to make for the kidletts for Christmas. We're currently snowed in up a mountain at a place called Rhosgadfan in North Wales, so I don't have access to all the pics on my home computer, but I'd half written this pocket softie skirt post before we left, so there are a few pics in it already for you. One of the things I made for the girls last year and totally failed to blog about were these dinky little skirts with soft toys in the pockets. All I used was some nice patterned scrap brushed cotton, a few lengths of ribbon, and the waist band I sewed on was just an "ear warmer" headband thing from the Dollar Tree. 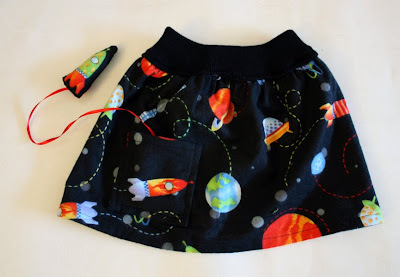 Little sister got the owl fabric skirt, with three little owl softies cut from the same fabric, and big sister got the outer space skirt with a softie rocket ship to go in the pocket. LiEr has been posting a load of great pocket tutorials on her blog Ikat bag lately and it reminded me of these skirts I'd made and then K posted about some little softies she'd made too on her blog "Made by K" and so I thought you might like to see this pretty simple project from last Christmas. I just sewed the fabric onto the headband when it was stretched taught, so that the skirt had a bit of fullness to it. The adult sized headband was the perfect size for an elasticated toddler waistband. 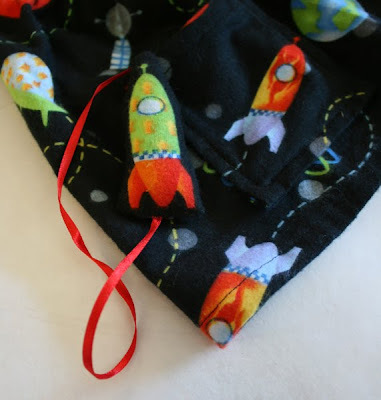 The softies that I made from the same fabric were attached to the ribbon and sewn into the pockets so that the kids could play with them, but not loose them. They worked out really well for random waiting in line places and that sort of thing. I liked the way the softies were made from the same material as the skirt, so Ffi's little owls could even have conversations with the rest of the non 3D owl community on her clothing, and Carys's rocket ship could visit the planets on her skirt. I really need to make more now that they are a year bigger because these ones are like mini skirts on them now, and can only reasonably be worn with leggings underneath these days! This time around, when I make new skirts I can try some better pocket sewing techniques, thanks to LiEr's tutorials! Given my current exhaustion levels, I might resort to sewing a few pockets on skirts they already have, and making ribbon pocket softies for them. I love the feel of brushed cotton, and there are so many cute kid prints available in it, that it'd also be nice to make a pillow case with a pocket and a couple of pocket softies to tuck into it at bedtime. I'm hoping to have a bit more get up and go, and a lot less barfing in the new year and that'll result in more knitty/sewy goings on. Homemade freaky unicorn pillow pet. (my mate back in the US is making a replica of this for her little girl at the moment. I hope it's going well jennifer!) Again, this was very quick to sew up. A little sewing/embroidery kit very cheaply. Fuzzy Felt friends and family set. I really want to make the kids an updated version of the one I made a few years ago. Maybe for my younger daughter's birthday in March. Printable christmas lego and hole punch set. Hope those links are useful to a few of you in the last couple of days before Christmas and I hope everyone gets some lovely time with their families over the next few days. I hate to think of all those people sleeping on the floor at the airport in London, just trying to get home :( Fingers crossed that won't be us next week. In the mean time I shall be stuffing my pregnant face with fish and chips, sausage rolls, Ribena, Rusholme Kebabs, Wensleydale cheese, and all manner of other British foods that I can't get my hands on back in California! Om nom nom!!! Congratulations on baby #3!!! I'm so glad that your year is ending so much happier than it started! Your softie skirts are adorable, I think I'll have to make some - and you are right that they are the perfect add-on to LiEr's brilliant pocket tutorials! I hope you and your family have a wonderful Christmas in Wales, and safe travels back to the US in the new year. So glad to see you back! And Congratulations on your new pregnancy! Hope all goes well :)Merry Christmas! 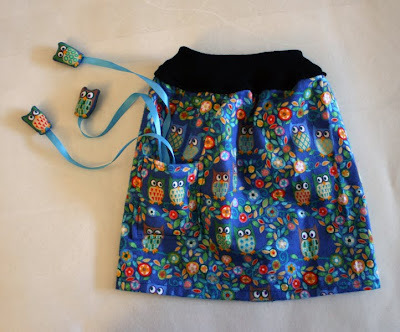 The skirts are fantastic -- my daughter would LOVE the owls! Congratulations!! Hope you and yours have a wonderful holiday, and enjoy! So glad things have changed for the better for you this year! Congratulations on your pregnancy!! Happy Holidays! Congrats on baby on the way - best wishes for good health, and all that! Oh, and Merry Christmas! Glad to see you back. I work at a daycare and find your blog so inspiring! Your children are so lucky to have such creative parents. So glad to see you are well. Enjoy the snow and all the British food! Eek!! Those skirts are absolutely ADORABLE! A project for January, for sure, thanks so much! YAY!!! For you and your family (and us readers!) So glad you're back, pregnant and sharing! Hope this Christmas time is peaceful and the New Year very blessed! Congratulations! I'd been wondering where you were! Glad to hear things are going better and that you'll have a new little munchkin to join in all the filth wizardry fun. Congratulations! I have been hoping everything was ok but didn't want to pry. Enjoy the fish and chips (yum!). Wonderful news for you and your family. Wonderful for us too, that you have returned to blogland! Did catch yet another mention of your work in the December issue of FamFun. Amazingly high note to end the year for you. Congratulations!! In addition, my bet is that you will rock the awesomometer! Linds! Happy new year! I hope Heathrow doesn't keep you away from home too long! My friend (lives in London) is stuck in NYC now, waiting to get home. What crazy weather we're having everywhere. I love those skirts! Who wouldn't love to find little stuffies in their pockets? Especially little stuffies that will never get lost? Did you sew them by hand? Downright amazing. So good to hear about the baby! Big hug!!!!! Am very happy. What a year this has been for you - but it looks like 2011 is set to be a brighter one. Am sorry you've had to bond with the porcelain throne so much - hopefully that phase will pass soon, and you can start enjoying everything a little more. P.S. Saw you again in Family Fun. Whoo! Punched fist in air for you (again). Have a wonderful rest of the month, look forward to seeing more from you in the new year! I'm so glad you all are doing well, I'm such a worrier. How wonderful about the addition! Congratulations to you all!!! Congratulations!! I was really missing your wonderful posts, it's great to have you back! Lovely skirts by the way! "A lot less barfing in the New Year". I'm sure we all wish for that. Lovely skirts for your lucky girlies! Love all your creative and clever ideas!! Congratulations on your new impending arrival! Having our third was the best decision we ever made (and then we went on to have our fourth, but don't get ahead of yourself!). I love your blog; you are such an inspiration. Funnily enough, my mother lives in North Wales... in Nantglyn, just outside of Denbigh, if you know it?